Mr. Quisling is definitely up to something mysterious, and Emily and James are on high alert. First, there’s the coded note he drops at a book event. Then they uncover a trail of encrypted messages in Mark Twain-penned books hidden through Book Scavenger. What’s most suspicious is that each hidden book triggers an arson fire. As the sleuthing friends dig deeper, they discover Mr. Quisling has been hunting a legendary historical puzzle: the Unbreakable Code. This new mystery is irresistible, but Emily and James can’t ignore the signs that Mr. Quisling might be the arsonist. 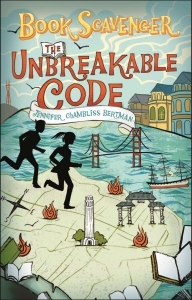 The clock is ticking as the arson fires multiply, and Emily and James race to crack the code of a lifetime. Could the books hidden through Book Scavenger contain clues to the arson fires plaguing the city? Find out in book 2 of the much-anticipated Book Scavenger series.